Last year on Earth Day I turned an old pinback button into a crocheted daisy. It seems like a recycling craft is a good Earth Day tradition, so here is this year’s trash-into-craft project. I have been accumulating a lot of plastic mesh bags. You know the kind that contain onions, potatoes, or California Cutie tangerines. I found that some are just the right size and elasticity to hold a yarn cake, but most couldn’t fill that job. Probably because of my recent fascination with tawashi (crochet and knit dish scrubbers) I thought of how much the mesh reminded me of nylon mesh pot scrubbers. So I decided to incorporate the plastic into knit and crochet scrubbers to increase their scrubbiness! In order to knit or crochet with the mesh, I first cut it into a long, continuous, 1 inch wide strip by spiraling down the bags. Since the mesh strips were pretty snaggy, I loosely wound them into balls. I decided to adapt two free patterns for my use, but you could use this technique with any washcloth pattern. 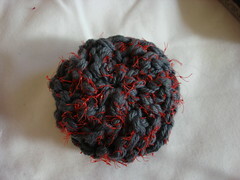 The patterns I chose are a knit (pdf download) and crochet version of a spiral scrubbie. The general idea is that you make a rhombohedron by increasing at one side and decreasing at the other side of your work (both increases and decreases are done on every row). Then you sew together the cast on and bind off edges to make a short tube. Then you cinch the openings closed and it buckles down into a circular spiral. Doesn’t it look like a little urchin?! Yarn: Peaches and Cream solid or other worsted weight 100% cotton yarn; Mesh strips. Needles: US#11 or US#12 or even larger if you knit tightly. I held the yarn doubled along with the mesh strip. Using yarn only cast on 10 sts. Repeat rows 1-2 16 times (8 garter ridges). 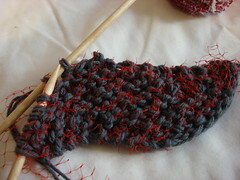 Cast off using yarn only. 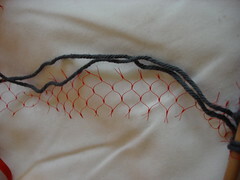 Using yarn only sew together cast on and bind off edges to make a tube with diagonal garter ribs. 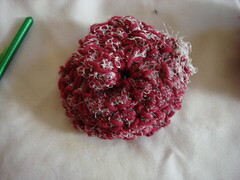 Cinch the top and bottom of the tube closed, and hide yarn and mesh ends inside the scrubbie. For this one, I pretty much stuck to the pattern, using only a single strand of yarn held with the mesh. I used only the yarn to cast on 10 stitches and used a size J crochet hook. 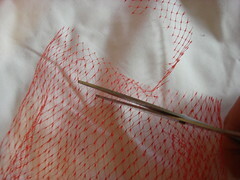 Mesh strips can be joined with a knot as you work. Don’t worry if the knot sticks out – it is just extra scrubbiness. 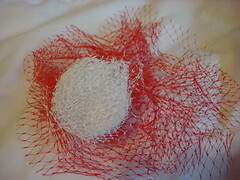 If you end up adding plastic mesh to your knit or crocheted cloths I would love to see how they turn out! 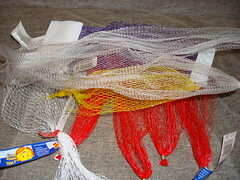 3 Responses to "Earth Day Urchin scrubbie"
What a great idea, to cut the mesh bags into strips! And the urchins are so cute! I absolutely love this! Uber RAD! It\’s on my list of things to make. Thank you for posting this project. Plastic Net Bags has many advantages: cheap, portable and useful, etc.